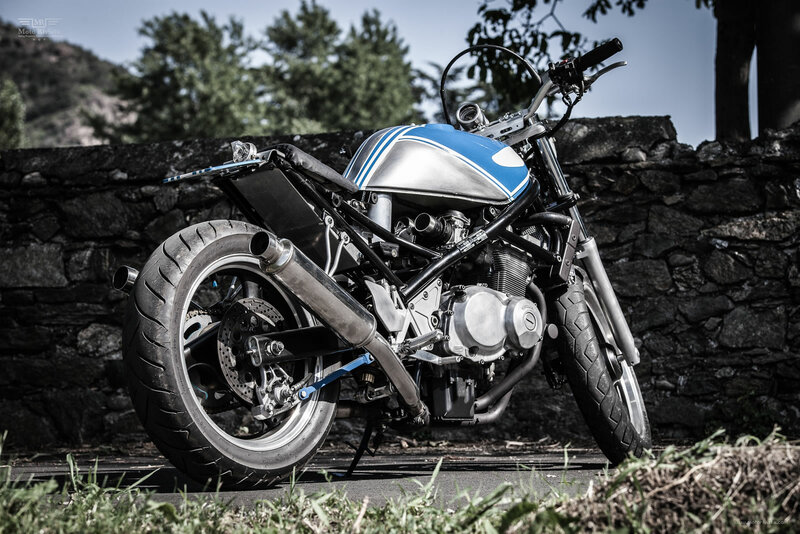 Today’s feature build a custom Suzuki GSF400 is the testament to the bonding between father and son. 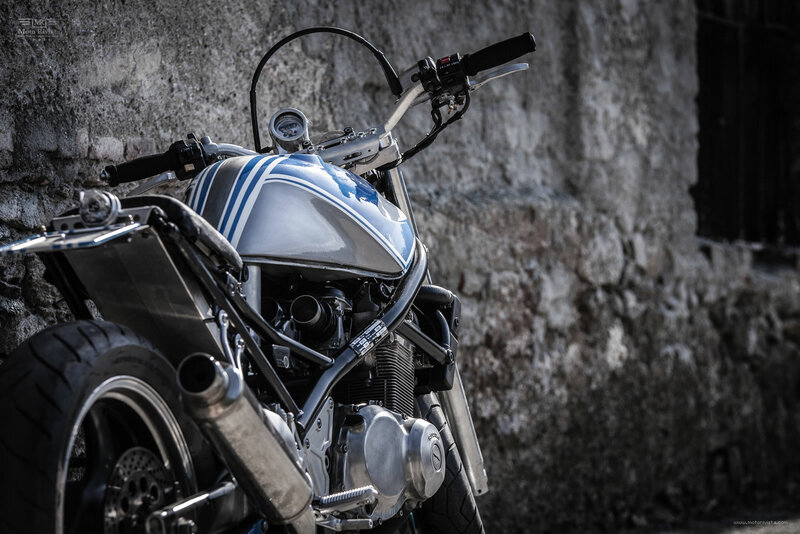 It’s not that often we feature a build from a family duo, a passionate father and a son working together on the project to build a one of kind custom Suzuki GSF400. According to Alessandro “I’m 37 years old and live in a little town between Aosta and Turin, called Borgofranco d’Ivrea, Italy. I’ve been an amateur supermoto rider in the past, but I’m not a great rider. I prefer to modify, paint and airbrush bikes. The engine, electrical and exhaust technician is my father, Pino, who is 63 years old. In the past he has ridden bikes such as CB350 Four, CB500 Four, GS750, XJ900 and XJ1200. I’m the “expert” of suspension, wheels, brakes and airbrush painting and also the art director. Together we restore and modify all types of old bikes and scooters. 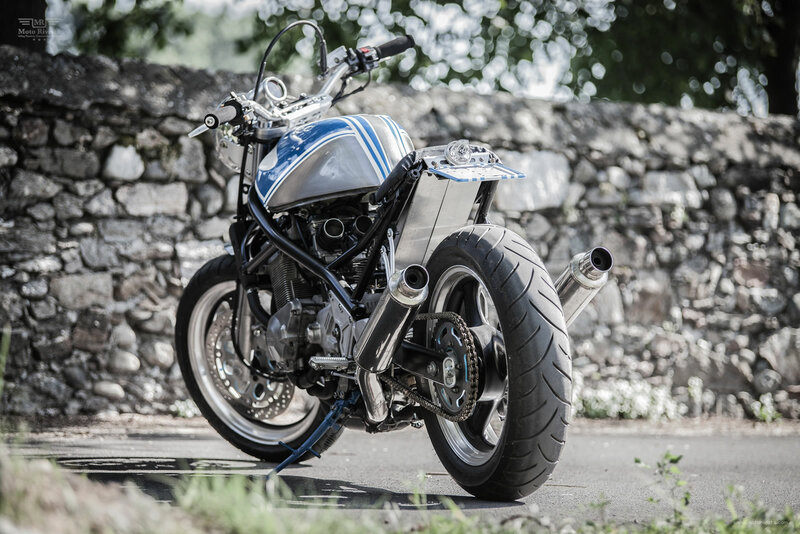 The base of the project is a common and cheap Suzuki GSF400. We bought it for 600 euros, with a valve guide broken. Our idea was with very hard work to build a special bike, but without spending a lot, and in the end to have a road-legal bike. Here in Italy there are strict laws in respect of the tyres & lights, the exhaust must be omologated and frame quote modifications are not allowed. 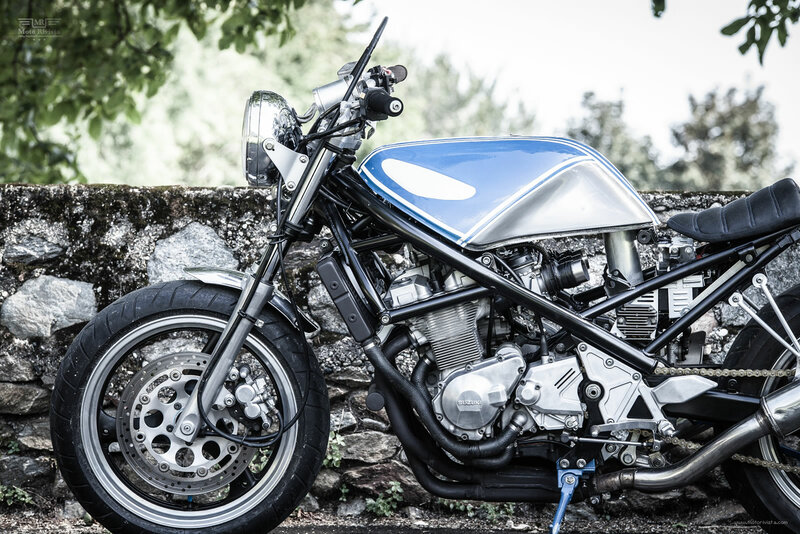 To begin with the build the stock Suzuki GSF400 was completely dismantled. We opened the engine and changed the entire head and camshaft with a newer version, we also changed the piston rings. Every piece of aluminium on this Suzuki GSF400 (such as the footrest, engine, brake pump and lever, clutch lever, fork etc) was sandblasted. 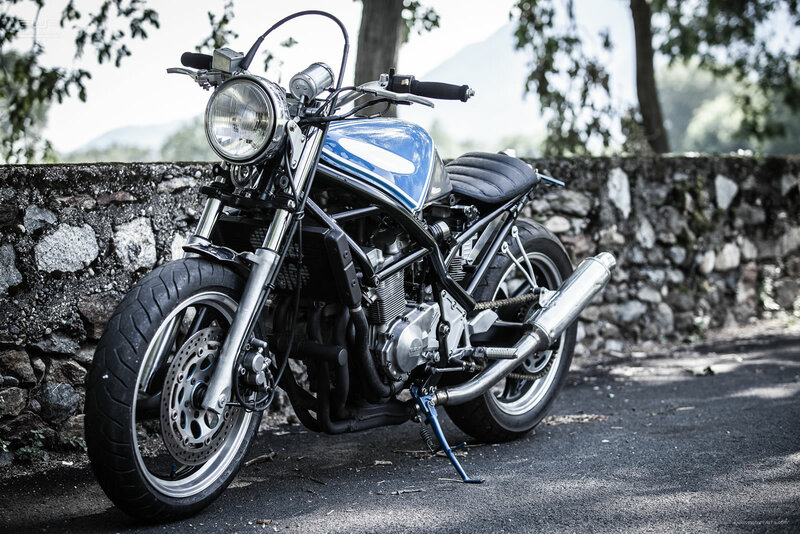 The stock Suzuki GSF400 frame was modified to adapt a single seat, the seat is the original Suzuki passenger, modified and relined. Some special parts, such as the footrest, the exhaust support, the under-seat cover and the air filter are hand made by us and some friends who have the right tools. All the original plastic parts were removed. The front fender is a portion of an old Honda c125s fender. The handlebar is a tommaselli for supermoto, which I’ve taken from my old Husqvarna. The wheels are originals, painted and mirror polished on the rims. My initial intention was to fit a pair of spoke wheels that we have, but I thought that modification was too expensive. Tacho is the original, but inserted in a old aluminium coffee machine (Napoletana, here in Italy). I think that the only instrument we need is the tacho: speed limit is important! We have spent a lot of hours on the exhaust fitting, I wanted the double exhaust but all GSF have a 4-1. The only Suzuki 400 with a double exhaust is the ’89 Suzuki GSXR400, which is only available for the UK and German market. But we managed to find one and we also found the oil sump, which is also different. The tank has also taken a significant amount of hours, and was totally stripped and repainted but not all around. I love the racing stripes and also the metal finish. 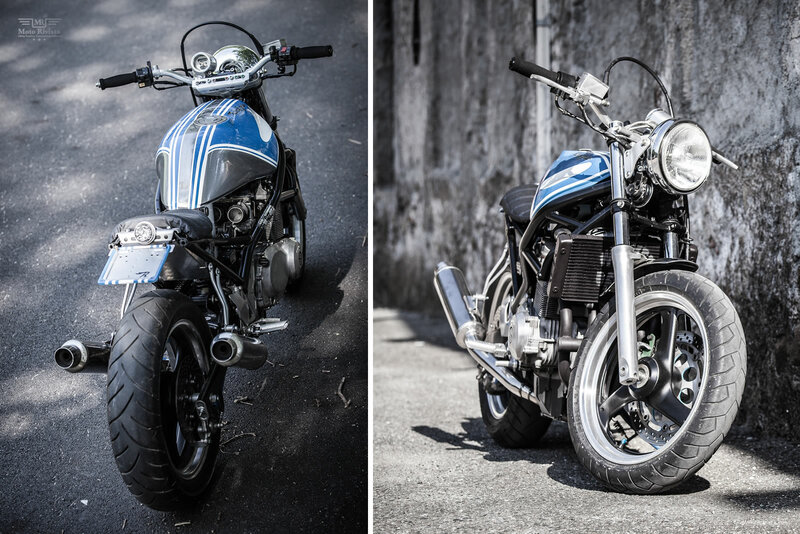 The total cost of this custom Suzuki GSF400 transformation is 1700 euros including the bike!